In Lessons One to Four, the features within a woodlot that determine habitat for forest wildlife were explained. Attention was given to species and habitats of conservation concern. The legal responsibilities for the Wildlife Habitat and Watercourses Protection Regulations were explained. Now, in Lesson Five, students will put this collective knowledge to use and incorporate wildlife into woodlot planning. Carl points out that he is not a forester nor does he own a woodlot. He hopes in this lesson to interact with woodlot owners to combine his knowledge of wildlife habitat with the hands-on know-how of people that wear chain saw pants and hard hats. Everyone’s goal for wildlife on their woodlot will be different. For some people, their woodlot is a recreational property and wildlife is important above everything else. For others, wildlife is a value, but the woodlot must generate an income. In general, forestry on woodlots is done at a smaller scale and for a more variety of products than on large industrial lands. As a consequence, many small woodlots do provide diverse wildlife habitats. For some owners, the management for wildlife and biodiversity will require a change from past approaches and likely require economic concessions, but in the long term they will have a healthier woodlot. Most woodlot inventories begin with an air photo and a walk about the property. When forest technicians do this inventory, they draw lines on an air photo around the different stands and indicate the tree species and age. They make recommendations on when and how a stand should be harvested. They might indicate where an access road should be built. They would indicate where Special Management Zones are required along a watercourse. The inventory is sometimes slanted towards forest economic values, but is a good map of the woodlot on which to map further wildlife values. Air photographs have a scale of 1:10,000. This makes distance and area conversion on the photographs easy. One centimeter equals 100 metres. One square centimeter equals one hectare. Other maps are 1:10,000 Forest Cover Maps interpreted from air photographs by Natural Resources and a visit to a District DNR office might obtain a photocopy of the portion covering a particular woodlot. These maps have information on stand tree species, stand heights, and volumes. The air photos and the cover mapping are usually done every 10 years, so they can lag behind current conditions. Carl recounts to the class that he used to mark softwood, mixedwood, and hardwood stands on these maps with colored pencils, but now fancy forestry maps can be printed using computers with GIS (Geographic Information System) software programs. Owners of long time family woodlots know their woodlot very well and have a lot of this information and history of past harvests in their head. However, obtaining a recent air photo and marking the locations of stands on an air photo is a great way to review. Good planners within the forest industry take the extra step of checking the DNR Significant Habitat and Species Mapping. Woodlot owners can also view this mapping through the Internet. Remember that there are many, maybe most, significant habitats not yet discovered and the DNR mapping is always a work in progress. Woodlot owners have an advantage in knowing what is present because of familiarity with their property. Establish Special Management Zones as required by the WH&WP Regulations. Additional to the regulations, establish SMZ to protect and provide riparian habitat surrounding vernal pools and all wetlands. In some locations widen the SMZ. Combine the SMZ with other lands to develop as old growth forest, or harvest by single tree and small patch uneven-age harvest methods. Avoid abrupt, long edges along narrow Special Management Zones but design rather with additional variable width and with feathered edges. Avoid laying out roads and skid trails during winter, because small streams may not be visible. Identify streams, ponds, wetlands, seeps, and vernal pools in early spring. Wet areas must be protected and forestry operations planned to avoid these areas. Important wildlife habitats not to overlook are vernal pools and woodland springs and seeps. When planning for roads, it is especially important to think hard, with map in hand, and avoid or minimize stream crossings. Be on the lookout for large stick nests. Listen and watch for the presence of raptors or herons. Be familiar with the habitats where rare plants and animals could occur, and be alert for their presence. Be familiar with the native tree composition within the woodlot. Recognize any rare or uncommon species. Wildlife managers are increasingly concerned about the amount of roads and other corridors crisscrossing forest environments. Roads are a barrier for species with small home ranges and limited mobility. Roads are psychological barriers for some larger animals. The increase in roads is thought a contributing factor to the decline in Nova Scotia mainland moose, because of vehicle collisions, disturbances, and greater access for poachers. The road footprint itself replaces growing space for plants. Roads are the major source of stream sedimentation. Plan the lowest density of permanent roads. Avoid loop roads but promote cul-de-sac roads. Upgrade existing roads if possible. Plan the most efficient layout. Keep the cleared right of way to the minimum necessary to meet basic construction, maintenance, and traffic requirements. For stands under even-aged management and with few anticipated intermediate treatments, use temporary roads only. For uneven-aged management areas use as few skid trails and interior roads as possible. Plan winter logging. Roads should not be built within riparian zones except where unavoidable. Avoid roads near all wetland habitats. Locate new roads where there is less chance of flooding by beavers. Locate roads between watershed headwaters or avoid stream crossings below low gradient basins with high potential for beaver flooding. Use “beaver puzzle” devices if a problem develops to retain wetland habitat at an acceptable water level. Previous lessons taught the importance to wildlife of horizontal diversity across the landscape and vertical diversity within the stand. The importance of retaining forest interior for some species was also covered in Lesson Three. Forest and wildlife managers, whether by intention or not, have done a good job in creating horizontal diversity. However they have been less successful at providing vertical diversity and retaining forest interior habitat. Planning for woodlot wildlife should make adjustments to provide larger blocks and manage these blocks with uneven-age selection methods. In Nova Scotia there is a growing interest in restoring climax dominant, long lived and shade tolerant tree species of the Acadian Forest. This requires a major move away from even-aged harvest that has favored shade intolerant tree types. Today 91 per cent of Nova Scotia forests are even-aged and are less than 100 years old. The need will continue for even-aged management for some tree species, but woodlot owners should begin to study selection harvest methods and to manage a higher proportion of their woodlots for uneven-aged stands. This change will develop vertical stand structure and will develop wider expanses of tall canopy. Carl states that he is no authority on uneven-aged management but has read that openings in the canopy, less than 6 metres wide, will favor shade-tolerant species such as sugar maples and eastern hemlock. Openings 10 to 50 metres wide will favor mid-tolerant species like oaks, white ash, and white pine. Openings that are greater than 50 metres wide will favor regeneration of white birch and popular. The light intensity in the openings determines which species gets a competitive edge. A comparison of this adaptation can be made to Coastal Plain Flowers, growing on a lakeshore, where the plants get a competitive advantage because they are adapted to shoreline flooding. In the shade under a forest canopy young shade-tolerant trees have a competitive advantage for early but slow growth, because light conditions are too dim for shade-intolerant species. Many types of wildlife will benefit when forest stands have multiple canopy layers. Woodlot owners should explore alternative silviculture and selection harvest methods that develop uneven-aged forests. Carl, for an example, points out a program in Ontario where Certified Tree Markers mark individual trees with different colour paints. Some are marked for harvest or cull. Some are marked for retention as wildlife tree or to continue growing. The result is a woodlot that is aesthetically pleasing, provides wildlife habitat, creates sustainable growing conditions, and provides a continuous supply of forest products. Much of the Algonquin Provincial Park is harvested by this method. Dan Barr tells a story of his friend Tom who is a silviculture contractor and has switched from the traditional industrial approach to forestry. Originally the approach was to clearcut and plant using fast growing, non-native softwoods. Deadwood was eliminated and plantations were intended to resemble farm fields. Tom was dissatisfied with that approach and now is an advocate for restoring the Acadian Forest. On his own land Tom says he now makes it messy and leaves standing deadwood. Tom says the economics are poor right now, but his goal is to grow high-quality wood, not large volumes of wood. Tom favors long-lived species when selection cutting or thinning, underplants Acadian forest species, and protects hardwoods found in softwood stands. Some of Tom’s land is old farm field grown with white spruce and balsam fir, which is not conducive to selection harvest methods. A portion of the woodlot should be managed by uneven-aged harvest methods. Single tree selection produces most canopy layering. Combine with small group selection to create small openings or gaps in the canopy. Maintain some softwood trees within hardwood stands and some hardwood trees within softwood stands. Retain supercanopy trees. Within even-aged harvests follow WH&WP Regulations to retain clumps of trees. Also combine across the harvest site with additional individual trees of deep-rooted trees, such as white pine and red oak. If plantations are necessary plant areas such as where white spruce was harvested and plant to restore Acadian species. In Lesson Two the major Acadian forest types and their dominant tree species were listed. These are the native shade-tolerant trees that woodlot owners should try to encourage to become the dominant canopy trees on their woodlots. However, there are other associated shrub and smaller tree species that add to the collective diversity and should not be eliminated. Some are important fruit or seed trees for wildlife such as mountain ash or hazel. Retain rare and uncommon tree species. Avoid eliminating naturally occurring species during selective harvests. Maintain naturally uniform stands, such as hemlock slopes or black spruce bogs, rather than converting to mixed stands. Maintain some softwood trees within hardwood stands and some hardwood trees within softwood stands. Lesson Three discussed how to recognize locations with high winter deer concentrations. Deer yard management might appear as a contradiction to a recommendation for less even-aged forest management and more uneven-aged management. Deer are an edge species. They feed in openings and utilize early successional forest stages. Deer are becoming increasingly numerous on edges of towns. Only during the harder winters is softwood cover critical for deer. Deer numbers in Nova Scotia have greatly fluctuated over the years, increasing through years of little snow and declining sharply following hard winters. Deer and other herbivores adapted to early succession forests will find food in the understory of uneven-age forests and at the edges of canopy gaps, but perhaps not in the quantity found over regenerating clearcut. A significant amount of even-aged harvest will continue even if there is a move towards selective harvests. Uneven-aged conifer forests will provide good winter cover. When possible, schedule winter harvests. Maintain a closed-canopy conifer over-story over at least 50 per cent of the DWA at any given time. Disperse harvest units rather than concentrating in one area. Widen the SMZ to 100 metres along each bank of larger streams where there is heavy deer movement. Maintain an unbroken conifer corridor along the shoreline. Some woodlot owners will hire contractors to do silviculture or harvest work. Seek out those contractors that understand Acadian forest processes and can begin restoration of multi-layered shade tolerant forests. Avoid contractors with large equipment, designed only for clear-cutting, even though they maybe able to offer better prices. The class has learned that 400 years ago probably 50 per cent of Nova Scotia was covered in old growth forest. Today there is only 1 per cent old growth forest. 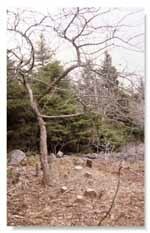 In 1999 the NS Department of Natural Resources made a policy to protect and restore old growth forest on 8 per cent of Crown lands in each of the province’s 38 EcoDistricts. Many of the locations that provide the best opportunities to accomplish this representation have been chosen. Many are not yet old growth forest, but are now reserved so that over time they will become old growth. Woodlot owners should consider also devoting a portion of their woodlot to develop as old growth or at least have old growth features. Imagine the biodiversity benefit of 30,000 Nova Scotia woodlot owners contributing to a patchwork of mature, late successional forest across the province. Carl has read an Extension Note from Ontario called Restoring Old-Growth Features to Managed Forests in Southern Ontario. Woodlot owners can develop the habitat features of old growth but continue to take forest products. It does not mean the forest is an economic loss. Like Dan’s friend Tom, the idea is to grow quality wood instead of lots of wood. Rather than leaving the forest alone, faster results to develop old growth characteristics are obtained by thinning and cutting small and large holes in the forest canopy. This mimics natural disturbances and speeds up the process of developing stands of several ages and heights. Wildlife trees including cavity trees, snags, mast trees, and supercanopy trees are retained. To develop more similarity to an original old growth stand, woodlot owners can keep a higher basal area and a greater number of large diameter (> 50cm) trees than specified in typical un-even aged management prescriptions. Many of Nova Scotia woodlots are long, narrow, rectangular shapes that often extend out behind farms. This is how land grants were made and how great grandparents divided land amongst children. Planning and working with neighbors has the potential to greatly reduce the amount of road construction. A combined effort can create larger units of interior forest and old growth forest, and better provide deer wintering cover. There are likely many combinations where features on one woodlot depend on adjoining habitats. For example, one woodlot might have a large wetland and animals using the wetland also require the forest cover on the neighboring property. One woodlot might have the only softwood in a predominant hardwood area. Like-minded woodlot neighbors should talk to discuss options. 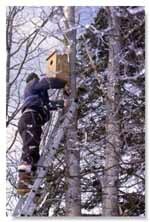 A woodlot with a good number of cavity trees does not need birdhouses, but they can be fun and are not discouraged. Carl tells how he along with the North Colchester Forest Co-operative had erected and then banded young in 40 kestrel boxes near Tatamagouche. The birds laid eggs in early May. Eggs took 30 days to hatch and another 30 days for the young to fledge. The young were banded before fledging. An acquaintance of Carl told of erecting chickadee houses near bogs and having boreal chickadees use them. Barred owls will use nest boxes and are an interesting bird to see and hear on a woodlot. Bat houses are popular, although in a woodlot bats are just as likely to crawl up under loose bark. A band of tarp paper wrapped around a tree is a good alternative to wooden bat houses. Lesson three exalted the benefits of having vernal ponds within a woodlot. Natural wetlands or watercourses enhance wildlife habitats. Carl provides a reference A Guide to Creating Vernal Ponds. If a woodlot lacks natural water features, constructing a pond will provide great wildlife benefits. Remember in Lesson Three, vernal ponds were described as highly variable in sizes and how long during the year they held water. A pond with permanent water is considered vernal if adult predatory fish are not present. Trout should not be stocked into ponds when the woodlot owner wishes to benefit amphibians. The reference above provides good information on what to consider and how to construct ponds and Carl will not repeat it here. An important caution is to build these ponds away from natural wetlands and watercourses; otherwise you must get approval from the NS Department of Environment and Labor. Ducks Unlimited is a good organization to contact for advice on building ponds and perhaps the names of good dozer operators. Dan Barr’s property once was a farm and now has a field that he keeps mowed and about 5 hectares of old field alder. There are several old apple trees along the old fencerows. Several of the apple trees are in poor shape and crowded by softwoods. Carl has given Dan a pamphlet Improving Wild Apple Trees for Wildlife on how to renew old apple trees. The technique is simple—remove trees that compete for light, prune off deadwood, cup-shape the apple tree’s crown, and fertilize. The alders in the old fields are large and passing into a later successional stage of young trees. These alder stands provide a unique habitat used by many birds. Alders add nitrogen to soils, increasing the fertility for wildlife. Dan wants to retain the alders and has resisted recommendations by forestry people to clear the alders and plant softwoods. Carl told him of work done in Maine, where strips are mowed through alder stands so alder stands are renewed. Over time three or four different aged strips are developed. This is described in A Landowner’s Guide to Woodcock Management in the Northeast. Carl introduced Dan to a group called The Woodcock Conservation Society who contracts a large machine called a Hydro-Ax and mowed strips over a third of the alders. When managing for backyard birds, gardening books always recommend that you plant lots of berry-producing shrubs. Woodlots are different. They already contain shrubs and trees for cover and many native plants that produce hard and soft mast. Wild strawberries, raspberries, and chokecherries are already seeded across the woodlot in the droppings of birds and mammals. Yet this should not discourage woodlot owners who wish to add food diversity to their woodlot. However, if you wish to add food diversity to you woodlot, we recommend that you plant native species or exotic species that are already well established. Consider cutting and propagating scions from wild apple trees—these produce many sweet apples that wildlife seems to like. Newly transplanted trees will need chicken wire protection for a few years. If a woodlot lacks a sufficient quantity of downed logs and other debris it is possible to drop cull trees and pile brush. Do not to remove good standing cavity trees. The following is a fancy example of a brush pile of popular logs with a protective tarp paper cap. Good habitat is the key to having wildlife on a woodlot. Wildlife has a broad definition and includes many groups of organisms. Having a diversity of habitats across the landscape and vertical diversity from ground level to treetop enhances habitat for forest wildlife. Horizontal and vertical diversity occurs naturally in native dominant forest types that have many tree sizes and ages. A strategy for providing good wildlife habitat on woodlots is a harvest approach that restores native long-lived, shade-tolerant tree species and restores features that resemble old-growth forests. These features are a multi-layered forest with a good supply of cavity trees and both standing and fallen dead wood. Care must also be taken to identify and protect sensitive and wet habitats. There is no quick fix for restoring Acadian forest structures and processes. It is a life’s work and it is hoped children and grand children are taught a land ethic and that good land stewardship will continue over many generations.